Courtesy of the GUARDIAN Newspaper of Great Britain. A woman British aviator has touched down in Sydney, completing her 21,000km solo flight from England in a vintage open cockpit biplane. “I need a drink. And I need a hairdresser,” Tracey Curtis-Taylor said as she climbed out of her 1942 Boeing Stearman, Spirit of Artemis, to cheers and applause at the Sydney, Austraila airport on Saturday. The 53-year-old pilot has flown across 23 countries, making 50 refuelling stops, since she set off from Farnborough in Hampshire, southern England, in October. Her mission was to emulate the pioneering British aviator Amy Johnson, who became the first woman to fly solo from Britain to Australia in 1930. Curtis-Taylor’s route took her across Europe and the Mediterranean to Jordan, over the Arabian desert, across the Gulf of Oman to Pakistan, India and across Asia. Encountering treacherous weather and navigating the politics of the airways were the toughest parts of the trip, she said. The highlights far outweighed the frustrations, she said. She rated looking down on Uluru as one of her top six moments, which also included flying across the Dead Sea in formation with an F16 Israeli military pilot. “That was amazing,” she said. Before starting her flight, Curtis-Taylor said in October: “For my whole life, I have been moved by the achievements of pioneers like Amy Johnson. “My own flight to Australia is the realisation of a burning desire to fly my beloved Boeing Stearman around the world following in their footsteps,” she told Press Association. She has recreated the essence of Johnson’s era of flying, with an open cockpit, stick and rudder flying with basic period instruments and a short range between landing points. She is not unfamiliar with this form of flying. 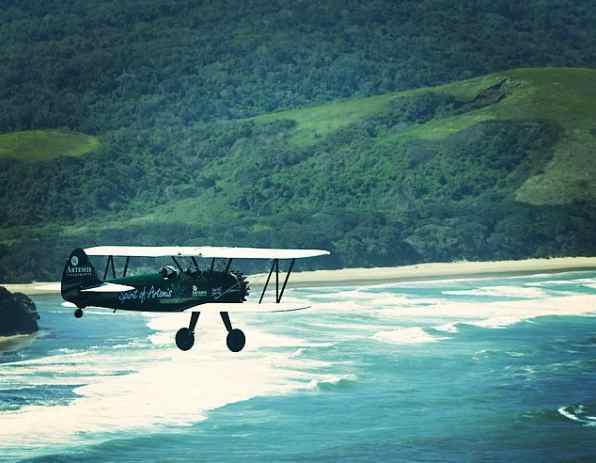 She flew 13,000km solo from Cape Town to the UK in 2013, recreating the 1928 flight of Lady Mary Heath. “I’m tired, it’s been a pretty intense week with all the build-up to the final arrival, I’m relieved, euphoric, it’s great to be here,” she said after completing her latest journey. Johnson had been a great inspiration to her throughout, she said. “You can’t do this without a great sense of empathy and sympathy for what she went through, what she achieved is so brilliant. Curtis-Taylor, originally from Stamford in Lincolnshire, but who grew up in Cumbria and now lives in London, said other highlights of her journey included flying over the the Arabian desert, the mountains of Burma and the coastline of Thailand. She said that despite having just completed the exhausting trip, she still had the drive to make further expeditions. “What I would really like to do is get back in the airplane and fly up the east coast of Australia. I wish I could keep going, I never want to land as the experience is so profound, it’s addictive,” she said. She said she would travel to New Zealand to celebrate her mother’s 80th birthday before joining her aircraft in Seattle for a coast-to-coast expedition across the US. “Why not keep going? Life should be about big projects,” she said.